A cheesy and smoky version of everyone's favorite appetizer. In a medium bowl, combine cream cheese, cheddar cheese and Monterey Jack cheese, until smooth. Slice hot dogs lengthwise almost all the way through, creating a pocket. Grill hot dogs 30 seconds per side, allow to cool and cut in half. Place bacon on a medium baking sheet and bake for 15 minutes, or until crisp. Allow to cool. To assemble francheezies: Place 2 teaspoons of cheese spread inside each hot dog half, top with 1 slice of bacon and place bacon side down on crescent roll. 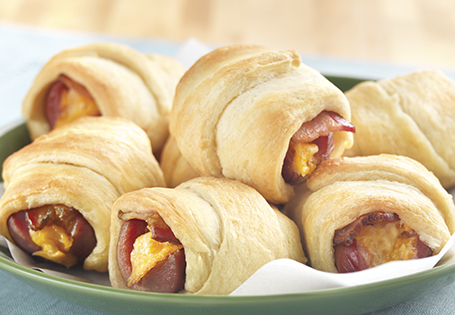 Wrap crescent roll around hot dog. Place crescent rolls, bacon side facing up, on a parchment lined baking sheet and bake for 12 minutes or until golden brown. Serve with your favorite condiments.